All Things Geek 2018 Father’s Day Gift Guide! PMBC Group’s clients, FIXD, KeySmart and simplehuman were featured in The Good Men Project. Father’s Day 2018 is this Sunday, June 17th. I got you covered! All below can be ordered and shipped by Sunday if you act NOW! I can tell you the first appearance of Thanos (The Invincible Iron Man #55) but when it comes to Auto repair? I know which side of the car the gas goes in.I’m completely lost. If your dad is like me then get him FIXD. 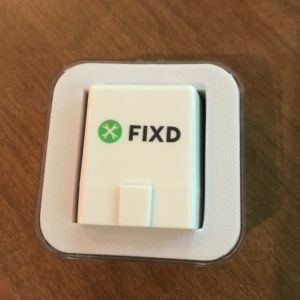 FIXD helps drivers understand and repair their vehicles. Paired with the free FIXD app, the small FIXD sensor plugs into the OBD-II port of any gasoline-powered car 1996 and newer and translates vague dashboard indicator lights into easy-to-understand, actionable insights. Utilizing FIXD, drivers are not only armed with knowledge about their vehicle, but also the severity of any issues and estimates of how much a repair should cost. With the FIXD Bluetooth enabled sensor & the FIXD App you can understand and maintain your vehicle for peak performance. Your “Check Engine” like could mean one of a hundred things. FIXD will tell you precisely what the issues are and how severe they are. Shows you the manufacturer maintenance schedule and alerts you when you’re due for a tune up. Monitors ALL your vehicles. Each FIXD device will share info on every family vehicle. FIXD synchs automatically & wirelessly as soon as your ignition starts and updates until you shut it off. For $1 a week you are eligible for FIXD Roadside Assistance Program with 24/7/365 Emergency Towing Support, Battery & Lockout Services . The FIXD Sensor plugs into your vehicle and connects to the free FIXD app to help you understand your vehicle. Only $59.99! Compatible with iOS and Android devices. Get FIXD today! 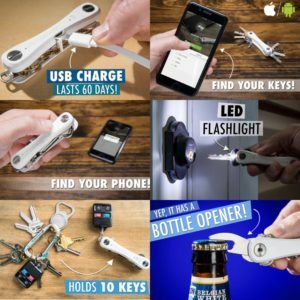 KEYSMART PRO WITH TILE SMART LOCATION TRACKING – NEVER LOSE YOUR KEYS! Find lost keys with your phone and find your lost phone with your keys! It works better the more keys you have, up to ten standard keys five per side, then you need an expansion available from the manufacturer. The rechargeable battery is listed by the manufacturer for 3 months and the app is intuitive. The flashlight not as good as your phones is but I could open my door in total darkness one handed without a problem. The price point of $59.00 is appropriate for this level of quality and innovation and I highly recommend the KEYSMART PRO. A large rectangular sensor can with voice control opens at the sound of your voice. 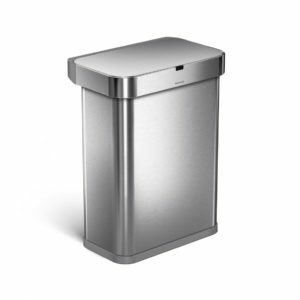 Just say, “open can” and the lid opens automatically, so throwing trash away is quick, efficient and hassle-free. It also has a motion sensor that opens the can with a wave of your hand and is smart enough to adapt to you and the surrounding environment — no false triggers, no unexpected lid closures. This can features our innovative ‘liner pocket,’ which stores and dispenses liners from inside the can for a faster liner change. The liner rim lifts up for easy access to the liner, then closes to grip and keep it neatly out of sight. An invisible nano-silver clear coat protects stainless steel from fingerprints and germs. ADA-compliant. Code Q liner refill packs store perfectly in this can’s liner pocket. Well, that’s all for now! Hope you find something for the Dad you love! Happy Fathers Day!